A woman sorts through a heap of garbage at the Dandora dumping site among other people, cattle, pigs and storks, in Nairobi (photo credit: Simon Maina / AFP / Getty Images). ‘There are fears that Africa’s next major modern disease crisis will emerge from its cities. Like Ebola, it may well originate from animals. Understanding where it would come from and how this could happen is critical to monitoring and control. ‘Growth and migration are driving huge increases in the number of people living in Africa’s urban zones. More than half of Africa’s people are expected to live in cities by 2030, up from about a third in 2007. ‘The impact of this high rate of urbanisation on issues like planning, economics, food production and human welfare has received considerable attention. But there hasn’t been a substantive effort to address the effects on the transmission of the organisms—pathogens—that cause disease. This is despite several influential reports linking urbanisation to the risk of emerging infectious diseases. ‘Africa’s cities are melting pots of activity and interaction. Formal and informal trading take place side by side. 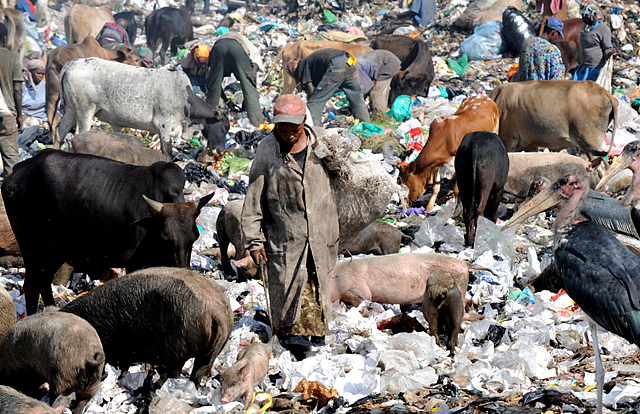 The wealthy live alongside the poor, livestock alongside people and waste is poorly disposed of near food production areas. ‘This degree of mixing and contact creates an opportune ecological setting for pathogen transmission for a variety of bugs. Already approximately 60% of human pathogens are zoonotic. This means that three out of five human diseases are transmitted from animals. Scientists predict that this is set to increase and that about 80% of new pathogens will have zoonotic origins. ‘Emerging infectious diseases are a major concern to the global public health community, both in terms of disease burden and economic burden. Understanding the processes that lead to their emergence is therefore a scientific research priority. Read the rest of this article at The Conversation: How an ‘urban zoo’ project in Kenya is helping unpack the spread of disease, 16 Nov 2016. Tags: Eric Fevre, The Conversation, Urban Zoo. Bookmark the permalink.